Elder Joseph B. Wirthlin, a member of the Quorum of the Twelve, taught, “The simple fact is this: anything that does not draw us closer to God takes us away from Him. We have no middle ground, no foggy gray area where we can sin a little without suffering spiritual decline. That is why we must repent and come to Christ daily on submissive knees so that we can prevent our bonfires of testimony from being snuffed out by sin” (Ensign, Nov. 1992). “As a young man I served a mission to Brazil. It was a marvelous experience. One of the wonders of the world in that great country is Iguaçu Falls. In the flood season, the volume of water spilling over the brink is the largest in the world. Every few minutes, millions of gallons of water cascade into the chasm below. One part of the falls, where the deluge is the heaviest, is called the Devil’s Throat. “There are some large rocks standing just above, before the water rushes down into Devil’s Throat. Years ago, reckless boatmen would take passengers in canoes to stand on those rocks and look down into the Devil’s Throat. The water above the falls is usually calm and slow moving, and the atmosphere tranquil. Only the roar of the water below forewarns of the danger lurking just a few feet away. A sudden, unexpected current could take a canoe into the rushing waters, over the cliff, and down into the Devil’s Throat. Those foolish enough to leave the canoes to stand on these treacherous wet rocks could so easily lose their footing and be swept away into the swirling currents below. “A disciple moves from darkness into light, which increases from the dim light of the stars to the moon and then to the brightness of the sun. Joseph Smith compared these heavenly bodies with the telestial, terrestrial, and celestial kingdoms. As the temple teaches, we can and should move toward that celestial light during mortality. We need not be of the world, even if we must live in the world. “Imagine that two vertical lines separate the stars, moon, and sun into three sections. Each line suggests a major transition as we move from one stage to the next. However, our journey is not rigidly sequential. Our experiences may move us back and forth. “Envision also two circles, each with a center point, located in stage one and in stage three. These circles represent the gravitational pull from the opposing poles of our journey. In the darkness of stage one, he who claims to be the god of this world exerts a constant force to hold us back from moving toward the light. As we cross the first barrier, we will leave the strongest satanic tugging—though he will always try to ensnare us wherever we are in the journey. “Thou didst do that which was grievous unto me; for thou didst forsake the ministry, and did go over into the land of Siron among the borders of the Lamanites, after the harlot Isabel.” (see Alma 39:1-5, emphasis added). Had Corianton stayed away from “the borders of the Lamanites” he may have never crossed paths with Isabel. He may have heard of her, but he probably would have never met her. He sought her out, and he found her–among the boarders of the enemy. Stay on “the Lord’s side of the line”! Stay upstream from the brink of the waterfall–“The Devil’s Throat”!! Stay far away from “the boarders of the Lamanites”!!! STAY SAFE, BY STAYING WITHIN THE BOUNDS THE LORD HAS SET! Chastity: What Are the Limits? Using an analogy of the planting and nourishing of a seed, Alma taught the people who were poor and cast out of the Zoramite synagogues what they must do to receive and nourish faith in the word of God (see Alma 32). Alma invited them (and us) to experiment on the word and to nourish their faith and testimony daily (see Alma 32:27). 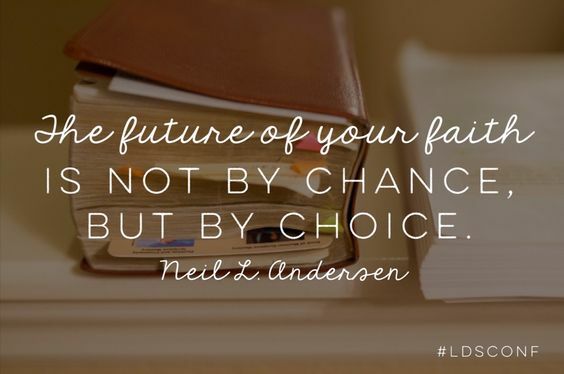 “Alma’s classic discussion on faith, as recorded in the 32nd chapter of Alma in the Book of Mormon, is a series of choices to ensure the development and the preservation of our faith. Alma gave us a directive to choose. His were words of action initiated by choosing. He used the words awake, arouse, experiment, exercise, desire, work, and plant. Then Alma explained that if we make these choices and do not cast the seed out by unbelief, then ‘it will begin to swell within [our] breasts’ (Alma 32:28). In the English version of the Book of Mormon, there is a cool little acrostic-type pattern that spells the word SEED in Alma 32:28. In this verse Alma is describing to the people some of the sensations that they will “begin” to experience as they choose to “experiment upon [his] words” (Alma 32:27). “A month ago in Brazil, I met Aroldo Cavalcante. He was baptized at age 21, the first member of the Church in his family. His faith burned brightly, and he immediately began preparing to serve a mission. Sadly, Aroldo’s mother was diagnosed with cancer. Three months later, only days before she died, she spoke to Aroldo of her greatest concern: There were no relatives to help. Aroldo would need to take full responsibility for his two younger sisters and his younger brother. He solemnly made this promise to his dying mother. “By day he worked in a bank, and at night he attended the university. He continued to keep his baptismal covenants, but his hopes for a full-time mission were gone. His mission would be caring for his family. “Months later while preparing a sacrament meeting talk, Aroldo studied the words that Samuel reprovingly spoke to King Saul: “To obey,” he read, “is better than [to] sacrifice.” (1 Samuel 15:22) Aroldo received the seemingly impossible impression that he needed to obey the prophet’s call to serve a mission. Undaunted by the obstacles before him, he moved forward with enormous faith. “Aroldo saved every Brazilian cruzeiro he could. At age 23, he received his mission call. He told his brother how much to withdraw each month from his account for the family. Aroldo still did not have enough money to pay the full cost of his mission and the living expenses for his brother and sisters, but with faith he entered the MTC. A week later he received the first of many blessings. The bank that had employed Elder Cavalcante unexpectedly doubled the money he was to receive as he concluded his work. This miracle, along with others, provided the needed income for his mission and his family during his absence. “Feasting on the word of God, heartfelt prayer, and obedience to the Lord’s commandments must be applied evenly and continually for your testimony to grow band prosper. All of us at times have circumstances beyond our control that interrupt our pattern of scripture study. There may be periods of time when we choose for some reason not to pray. There may be commandments that we choose for a time to ignore. “One of our outstanding missionaries that served with us in the Canada Toronto Mission years ago came to my office in Salt Lake City. During our visit, he told me that he was losing his faith and his testimony and that he had many questions. I asked him to write down his questions and promised to find answers to them, certainly as many as I could. As he was about to leave . . . I said, ‘Elder, how long has it been since you have studied the scriptures; specifically, how long has it been since you have read from the Book of Mormon?’ He lowered his head and said he had not been doing that. I gave him an assignment to begin reading the Book of Mormon for an hour each day while I worked to prepare answers to his questions. He agreed to do so. “I am reminded of two young men who came in to see me some months ago. They had been recommended by their priesthood leaders. From the moment they stepped into the office, they began in a very sincere way questioning certain doctrines and teachings and procedures of the Church. Their attitude, however, was not antagonistic, as they were sincerely looking for answers. “I asked them finally if their questions perhaps represented the symptoms of their problem and not the cause. Wasn’t their real question whether or not this church is true? Whether or not it is actually the Church of Jesus Christ? And whether or not it is led by divine revelation? The young men agreed that perhaps if they were sure of the answers to these questions, they could take care of the other questions that seemed to arise in their hearts. “If we are going to experiment with the things of Christ, then we are going to have to put these things to a spiritual test—a test that the Savior himself has outlined for all those who wish to know, a test of doing. “I asked them if they read the scriptures. “I asked them if they prayed. “I asked them if they kept the Word of Wisdom. “I asked them if they went to church. They said they’d stopped. “I asked them if they would be interested in a three-month experiment. They said they would try but were not anxious to commit themselves until they found out what I had in mind. “They thought for a moment and said they would. “One of these young men, who considered himself an agnostic, balked at this, but then he finally agreed to do it on the basis that for the sake of the experiment he would accept the premise that there is a God and would appeal to this God for the light and knowledge which he was seeking. “I asked them if in the next three months they would refrain from drinking, smoking, and drugs. Although this created some anxiety, they resolved to do it. “I asked them if in the next three months they would resolve to keep themselves morally clean and in harmony with the principles of virtue which the Savior taught. They said they would. And then I suggested they establish a schedule, on their own, during the next three months to read the Book of Mormon from cover to cover—a few pages each day, with a prayer at each reading that the Lord would bless them to know if the book is true and actually from him. They agreed. Brothers and sisters, welcome to this Worldwide Devotional for Young Adults, with a special welcome to those of you who will graduate this year from seminary—a praiseworthy achievement and evidence of your faith and love of the Lord. I invite you to follow the example of many others here tonight and continue your quest for spiritual learning in a local institute of religion or at a Church university. I promise you that you will continue to receive important guidance for all other vital decisions in your life, as well as meet people who will have a significant impact in your life. Tonight you are going to hear me bear witness of the Lord Jesus Christ and His gospel. You are going to hear me use the words “I know.” I want to describe to you how I came to know that He is the literal Son of God, the Redeemer and Savior of the world, and that His gospel is true. I also want to help you discover that your own testimony of the Lord Jesus Christ and His gospel is much stronger than you may think it is. Where Is My Testimony on the Faith Spectrum? At the bottom is the atheist. We will score the atheist a zero. At the top of the scale is a 10, or to have a perfect knowledge of Jesus Christ and His gospel. Where would you place yourself on this spectrum? I suspect that many of you would give yourself a lower score than you deserve. Remember the score you have given yourself to see if it increases during the course of this presentation as we discuss various faith-building aspects of a testimony and how each one helps advance us on the faith spectrum and experience greater peace and happiness. Alma invites each person to take the first step forward on the faith spectrum with “an experiment upon my words, and exercise a particle of faith, yea, even if ye can no more than desire to believe” (Alma 32:27; emphasis added). The following insight illustrates the wisdom of taking this first step of desire. In the column headings are two options: either God exists or He does not. In the rows are also two options: I can either choose to believe or not believe. If God exists and I believe and act accordingly, I can inherit eternal life. If I believe and God does not exist, I lose nothing. If I do not believe nor honor or obey God and He exists, I forfeit eternal life. If I do not believe and God does not exist, I gain nothing. 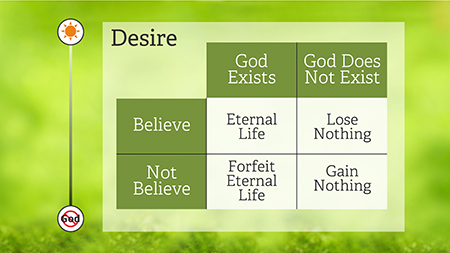 Pascal’s Wager argues that the optimal decision is to believe in God’s existence and that only a fool would bet against the existence of God because he has everything to lose and nothing to gain. The prodigal son would argue that what he loses is the chance to “eat, drink and be merry” (2 Nephi 28:7)—a poor consolation prize when you consider what is at stake. He may “have joy in [his] works for a season, [but] by and by the end cometh” (3 Nephi 27:11). His dreams of merrymaking and revelry become a living nightmare as he inevitably awakens to the spiritual hangover he experiences in this life and discovers for himself that “wickedness never was happiness” (Alma 41:10) and later, at judgment day, when he “shall confess before God that his judgments are just” (Mosiah 16:1). In due course he learns that he has been duped by the master of illusion with his sugarcoated brand of pleasure-disguised misery. Hence, “let not thine heart envy sinners” (Proverbs 23:17). Thank goodness there was a second chance for the prodigal son, which is one of the great lessons the Savior expects us to learn from this parable (see Luke 15:11–32). “Let this desire work in you, even until ye believe in a manner that ye can give place for a portion of my words. “Now, we will compare the word unto a seed. Now, if ye give place, [let the] seed … be planted in your heart” (Alma 32:27–28; emphasis added). 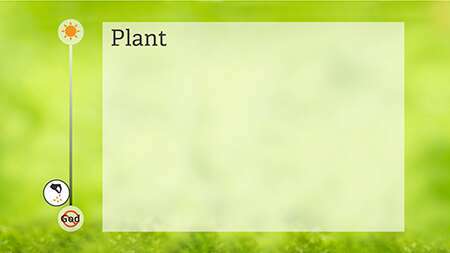 Planting the seed means you have now acted on the desire with an inspired curiosity in the experiment. You have now initiated the learning process. According to the scriptures, this learning process should proceed in two ways: “And as all have not faith, seek ye diligently and teach one another words of wisdom; yea, seek ye out of the best books words of wisdom; seek learning, even by study and also by faith” (D&C 88:118; emphasis added). “Yea, behold, I will tell you in your mind and in yourheart, by the Holy Ghost, which shall come upon you and which shall dwell in your heart. “Now, behold, this is the spirit of revelation” (D&C 8:2–3; emphasis added). Before returning to the faith spectrum, I want to illustrate the interrelationship between the two learning methods and the two learning channels. Cross-connecting them should give you some helpful insights on how we continue to progress along the faith spectrum. When Joseph Smith learned about prayer by study, he was reading in the Bible, “If any of you lack wisdom, let him ask of God, that giveth to all men liberally, and upbraideth not; and it shall be given him” (James 1:5). Joseph learned about prayer by faith when he acted on his belief and went into the Sacred Grove and prayed. 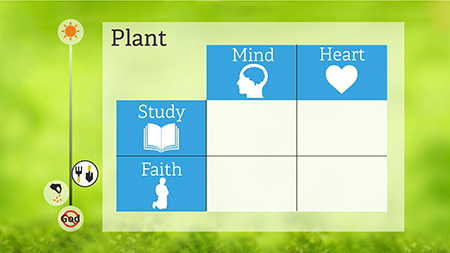 At the top of the visual are the two learning channels—the mind and heart. When we seek learning by study, the Lord speaks to our mind in the form of inspired thoughts. 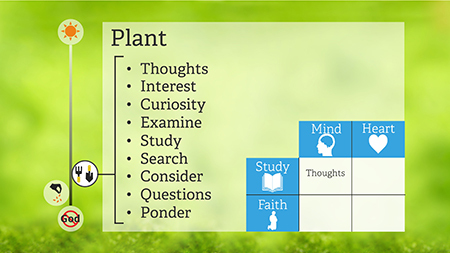 Among other possible words relating to the intersection of “Study” and “Mind,” we could add the following: thoughts, interest, curiosity, examine, study, search, consider, questions, and pondering. Inspired questions cause one to ponder, and pondering under the influence of the Spirit takes you to the next level of learning, where study intersects with the heart. Your pondering is nourishing the seed, and it begins tosprout, and you begin to have feelings inspired by the Spirit. It is the heart, or inspired feelings, that changes a thought into a belief. Alma states it this way: “If it be a true seed, or a good seed, if ye do not cast it out by your unbelief, that ye will resist the Spirit of the Lord, behold, it will begin to swell within your breasts; and when you feel these swelling motions, ye will begin to say within yourselves—It must needs be that this is a good seed, or that the word is good, for it beginneth to enlarge my soul; yea, it beginneth to enlighten my understanding, yea, it beginneth to be delicious to me” (Alma 32:28; emphasis added). While we normally associate the word understand with the mind, multiple scriptures link understanding with the heart, such as “and their hearts were open and they did understand in their hearts the words which he prayed” (3 Nephi 19:33). When he spoke of James 1:5, young Joseph said, “Never did any passage of scripture come with more power to the heart of man than this did at this time to mine” (Joseph Smith—History 1:12). With those kinds of feelings, Alma says, “Now behold, would not this increase your faith ? I say unto you, Yea; nevertheless it hath not grown up to a perfect knowledge” (Alma 32:29; emphasis added). It is not yet a perfect knowledge. However, with the heart touched, it inspires us to take another step on the faith spectrum. For Joseph, it inspired him toact and accept the scriptural invitation to pray. He would not “receive [a] witness until after the trial of [his] faith” (Ether 12:6). Learning by faith requires acting on feelings and beliefs.1 The Savior gave this very invitation to learn by faith when He said, “If any man will do his will, he shallknow of the doctrine, whether it be of God, or whether I speak of myself” (John 7:17; emphasis added). In this verse the Savior teaches us that doing is the act of faith that turns a belief into knowledge. For naysayers He exhorts, “Though ye believe not me, believe the works:that ye may know, and believe, that the Father is in me, and I in him” (John 10:38; emphasis added). “And now, behold, because ye have tried the experiment, and planted the seed, and it swelleth and sprouteth, and beginneth to grow, ye must needs knowthat the seed is good. 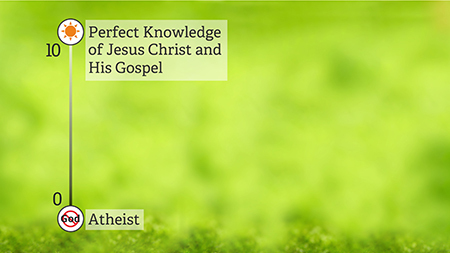 “And now, behold, is your knowledge perfect? Yea, yourknowledge is perfect in that thing, and your faith is dormant; and this because you know, … your understanding doth begin to be enlightened, and your mind doth begin to expand” (Alma 32:33–34; emphasis added). Acting on your faith has given you knowledge. 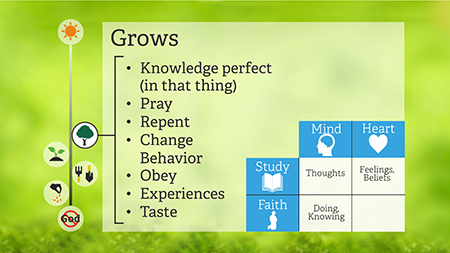 Among other words we might associate with learning by faith and the mind, we could add the following: knowledge perfect (in that thing), pray, repent, change behavior, obey, experiences, and taste. “O then, is not this real? I say unto you, Yea, because it is light; and whatsoever is light, is good, because it is discernible, therefore ye must know that it is good; and now behold, after ye have tastedthis light is your knowledge perfect? “Behold I say unto you, Nay; neither must ye lay aside your faith, for ye have only exercised your faith to plant the seed that ye might try the experiment to know if the seed was good” (Alma 32:35–36; emphasis added). It is tasting the light and savoring it that has given you a perfect knowledge in that thing, or knowing that the seedling is good. The light is inviting you to come unto Jesus Christ, “and the power of God [is] working miracles in [you] … and [converting you] unto the Lord” (Alma 23:6). “… Behold, by and by ye shall pluck [or taste] the fruitthereof, which is most precious” (Alma 32:37, 41–42; emphasis added). 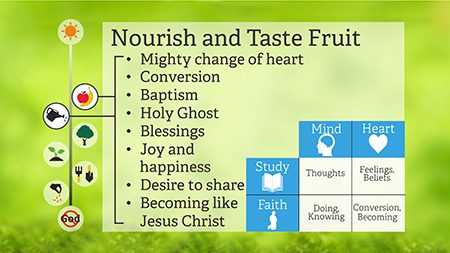 Tasting of the fruit advances us to where learning by faith and the heart intersect. Here we discover for ourselves that the fruit is, indeed, sweet and precious. Following Jesus Christ, and doing His will, allows us to taste of His Atonement and the gospel in multiple ways. Earlier in the process our hearts were deeply moved.Now “a mighty change [of] heart” is occurring, as described by Alma (Alma 5:12), and the Spirit is turning our experience and knowledge into conversion. When we are “converted unto the Lord” (Alma 23:8), we follow the Savior by being baptized and receiving the gift of the Holy Ghost. As we taste the fruits of the gospel, we experience blessings and such joy and happiness that we want to share it with others, just as Lehi did: “And as I partook of the fruit thereof it filled my soul with exceedingly great joy; wherefore, I began to be desirous that my family should partake of it also; for I knew that it was desirable above all other fruit” (1 Nephi 8:12). To be “converted unto the Lord,” in a literal sense, is themighty change and transformation of becoming like Jesus Christ, by “[yielding] to the enticings of the Holy Spirit, and [putting] off the natural man and [becoming] a saint through the atonement of Christ the Lord” (Mosiah 3:19). In the more comprehensive sense of the word, our conversion won’t be complete until we have grown spiritually “unto the measure of the stature of the fulness of Christ” (Ephesians 4:13). This will be a lifelong pursuit and journey of faith in Him and with His grace or divine help (see 2 Nephi 25:23). This lifelong conversion will clearly require continued nurturing on our part to avoid the withering effect described by Alma: “But if ye neglect the tree, and take no thought for its nourishment, behold it will not get any root; and when the heat of the sun cometh and scorcheth it, … it withers away” (Alma 32:38). “Wherefore, ye must press forward with a steadfastness in Christ, having a perfect brightness of hope, and a love of God and of all men. 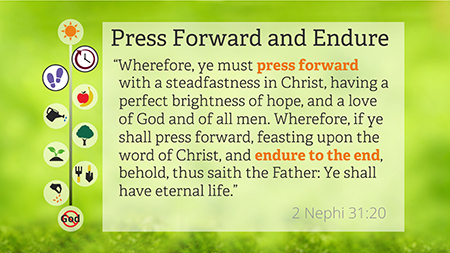 Wherefore, if ye shall press forward, feasting upon the word of Christ, and endure to the end, behold, thus saith the Father: Ye shall have eternal life” (2 Nephi 31:20; emphasis added). This mighty change and conversion doesn’t mean we won’t still have questions. However, having tasted the light, questions should instill in us a desire to continue learning rather than causing doubts that can wither our growing faith. “And whosoever shall believe in my name, doubting nothing, unto him will I confirm all my words” (Mormon 9:25). Questions are good. They cause us to ponder, search, and pray. Joseph Smith continued to have questions throughout his life. Nearly every section of the Doctrine and Covenants was revealed through him as a result of a question he took to the Lord in prayer, line upon line, and precept upon precept. This is the same way the Savior learned: “And he received not of the fulness at first, but continued from grace to grace, until he received a fulness” (D&C 93:13). “For behold, my brethren, it is given unto you to judge, that ye may know good from evil; and the way to judge is as plain, that ye may know with a perfect knowledge,as the daylight is from the dark night. “And now, my brethren, seeing that ye know the light by which ye may judge, which light is the light of Christ, see that ye do not judge wrongfully” (Moroni 7:15–16, 18; emphasis added). With that light as our seal of truth, we continue to progress on the faith spectrum line upon line, and precept upon precept (see 2 Nephi 28:30; D&C 98:12;128:21), “and by the power of the Holy Ghost ye may know the truth of all things” (Moroni 10:5; emphasis added). In just a moment we will actually try Alma’s experiment so that you can be reminded of what the light tastes like and how it gives you a perfect knowledge. Before going forward with the experiment, it is important to identify another essential element in the process. We are taught in 2 Nephi 2 that there “must needs be … an opposition in all things” (2 Nephi 2:11). Humankind “taste the bitter, that they may know to prize the good” (Moses 6:55). Health, for example, is primarily the study of its opposite, sickness and disease; freedom, the study of oppression and slavery; happiness, the study of sorrow; and so on. And like the tiny miracle of fireflies, light goes unappreciated without a dark backdrop. Opposition not only reveals or unveils the truth but manifests its inherent power, joy, and sweetness. For example, it took a taste of the bitter life for the prodigal son to realize what a sweet life he had abandoned back home and had taken for granted in his youth. These are only a handful of the scores of Christlike virtues, but sufficient to clearly demonstrate the effectiveness of the seed experiment. In pondering this list, you recognize that you have come to know the power, truth, and sweetness of each virtue, one by one, through thousands of validating experiences. Good fruit comes with its own inherent proof and validation—its taste! The proof is in the eating, fruit by fruit and line upon line, each with a “perfect knowledge.” Perhaps that is what the Apostle Paul meant when he said, “Prove all things; hold fast that which is good” (1 Thessalonians 5:21; emphasis added). 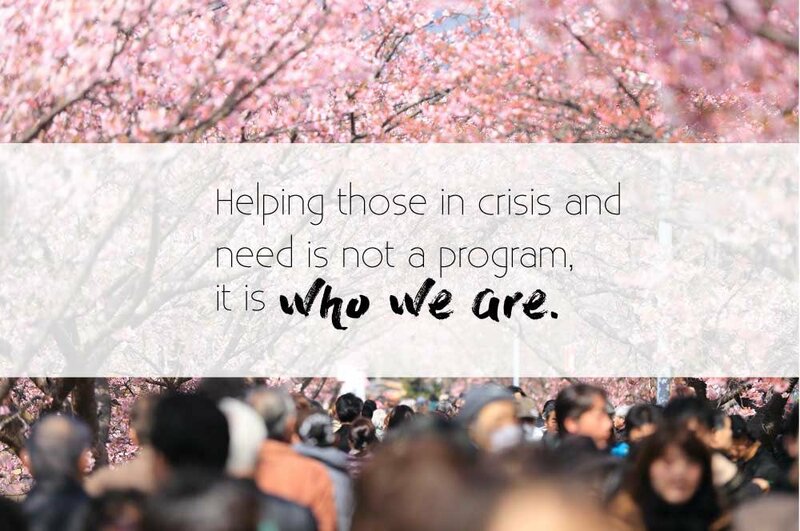 If you have integrated these and other virtues into your life, you are much further along the faith spectrum than you likely thought you were. However, this is only what I would call a terrestrial, or glory-of-the-moon, testimony. Good God-fearing persons of any religion have this same testimony because they too have the Light of Christ, of which Mormon spoke, and have accepted a portion of His gospel. A celestial, or glory-of-the-sun, testimony comes as one seeks “the fulness of the Father” (see D&C 76:75–78;93:19). When a person is baptized and worthy of the gift of the Holy Ghost, he or she receives a greater endowment of the Light of Christ, as noted in this Book of Mormon verse: “If this be the desire of your hearts, what have you against being baptized in the name of the Lord, … that he may pour out his Spirit more abundantly upon you” (Mosiah 18:10, emphasis added). “And he that receiveth light, and continueth in God, receiveth more light; and that light groweth brighter and brighter until the perfect day” (D&C 50:24). It’s enlightening to contrast truth with its opposite. It helps reveal the obvious, that which is hidden in plain view. We recognize that we know a lot more than we thought we did. It should inspire us to continue to “search diligently in the light of Christ … and … lay hold upon every good thing” (Moroni 7:19). Now let’s examine another interesting aspect of faith and testimony. Laman and Lemuel saw an angel (see 1 Nephi 3:29). They heard the voice of the Lord that “did chasten them exceedingly” (1 Nephi 16:39). They felt God’s power when Nephi stretched forth his hand and “the Lord did shake them” (1 Nephi 17:54). They tasted and smelled: “I will make thy food become sweet, that ye cook it not” (1 Nephi 17:12). In spite of multiple manifestations through all five senses, Laman and Lemuel rebelled. Was seeing believing for them? When Moses led the children of Israel out of Egypt, they witnessed plagues, pillars of fire, the Red Sea part; they tasted manna—experiences with all five senses. “And notwithstanding they being led, the Lord their God, their Redeemer, going before them, leading them by day and giving light unto them by night, and doing all things for them which were expedient for man to receive, they hardened their hearts and blinded their minds, and reviled against Moses and against the true and living God” (1 Nephi 17:30). Seeing certainly wasn’t believing for them! There are many other similar examples in the scriptures, but the most dumbfounding example of all is of the spiritually inept who rejected the Savior in His very presence. “But though he had done so many miracles before them, yet they believed not on him” (John 12:37; see also D&C 138:26). There are too many examples to the contrary to say that seeing is believing. Those hoping for just one spectacular experience to help define their testimony don’t realize that the greater testimony and witness of the Spirit comes to us daily, in many small ways, such as the last time you underlined your scriptures. Think about it. The reason you underlined your scriptures is because you received an impression, an insight, an “Aha!” An inspired impression is revelation. Another example of revelation is when you are prompted to be kind or do a good deed, “for every thing which inviteth to do good … is sent forth by the power and gift of Christ” (Moroni 7:16). The Light of Christ is ever present! You are tasting it every day. And from these whisperings, these “small things proceedeth that which is great” (D&C 64:33). Can you think of anyone in the Book of Mormon who saw an angel and did believe? You are likely thinking of Alma the Younger. An angel had appeared to him and to the sons of Mosiah and “descended as it were in a cloud; and he spake as it were with a voice of thunder” (Mosiah 27:11). You know the rest of the story—Alma’s repentance and subsequent ministry. “And this is not all. Do ye not suppose that I know of these things myself? Behold, I testify unto you that I do know that these things whereof I have spoken are true. And how do ye suppose that I know of their surety ? “Behold, I say unto you they are made known unto meby the Holy Spirit of God [the light]. Behold, I have fasted and prayed many days that I might know these things of myself. And now I do know of myself that they are true; for the Lord God hath made them manifest unto me by his Holy Spirit; and this is the spirit of revelationwhich is in me” (Alma 5:45–46; emphasis added). A “wake-up call” or a short-term change in behavior may result from the outside in, through the five senses, but is always short lived, as with Laman and Lemuel. An enduring testimony can only come from the inside out, as one learns by study and faith with the Holy Ghost planting the gospel “in their inward parts, and [writing] it in their hearts” (Jeremiah 31:33). 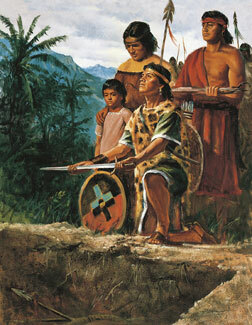 That is why the Nephites, who in spite of having seen, heard, and felt the Savior at the time of His visit to them, as well as tastingand smelling bread miraculously provided by Him (see3 Nephi 20:3–9), nevertheless “[prayed] for that which they most desired; and they desired that the Holy Ghost should be given unto them” (3 Nephi 19:9). “I was living alone in Provo, Utah, in a small apartment close to the center of town. I was working as a salesman in a small furniture store in Provo, and it was during the long weekend surrounding the New Year’s holiday that this incident occurred. “We had a long weekend holiday. It was Thursday, December 31, New Year’s Eve. We had been given from Thursday through Sunday off from work, and I was in my apartment without any plans of celebration. I was preparing my dinner, waiting for it to bake, and wanted something to read. Not having anything in the apartment, I went next door to ask some young men who were living there (students at BYU) if they had something—hoping for a copy of Field & Stream, or something of that order. They said they did not have any magazines, but they did have a book I might like to read. They handed me a copy of the Book of Mormon. “‘Did you pray about it?’ one young man asked. ‘Pray about it?’ I responded. ‘I just wanted something to read, not something I had to pray about.’ This started a very interesting conversation about the content of the Book of Mormon. They told me that it was a book of scriptures, a book that if I would first pray about and then read with a real desire to know if it was true or not, that God would reveal the truth of it to me by the power of the Holy Ghost. “The names and places were the same as those I had read just a couple of hours before. The only difference this time was a ‘suspension of disbelief’ that had magically come over me. I was literally in the book! I could see Nephi; I could see his brothers, and it angered me when they mistreated him. I liked Nephi! I cheered the good guys on, and I felt sorry for the bad guys. I read for hours, and I couldn’t put the book down. When I finally looked at my watch, it was almost five o’clock in the morning. I wished myself Happy New Year and went to sleep. “I woke up about eight thirty and instinctively reached for this book. And that is the way the rest of the weekend went. Like Brother Parley P. Pratt, the thought of food was a nuisance, I did not want anything to disturb me. I took my phone off the hook and read all day, with only occasional interruptions for quick snacks. Like the first night, I would finally realize it was early in the morning, sleep a few hours, pick up the book, and continue with my self-imposed marathon. Finally, about five o’clock on Monday morning, I finished the book and I fell asleep—exhausted. “Just before Christmas that year, I had sold a large carpet job in the American Fork area. It was a specialized type of carpet, and my boss wanted me to supervise the carpet layers. My boss was a former bishop in the Provo area and had talked to me about the Church on several occasions, but I would have none of it. He was a good boss, but you did not want to provoke him because he had a temper. It was on this Monday morning, at eight o’clock, that I was supposed to supervise the carpet installation. The appointed time came, and I did not appear; nine o’clock, then ten. “Finally, around ten thirty, my boss, mad as a wet hen, came to my apartment, walked in the door ready to tear my head off, saw me lying on the couch with the Book of Mormon laying on my chest, and changed his mind. He quietly closed the door and went back to the shop, confident that he could get the carpet layers started. Just after eleven thirty I awoke (not knowing of my boss’s visit), looked at the clock, and for the second time in a relatively short time said another prayer. I quickly dressed (believing that when I got there I probably would not have a job left), got into my car, and sped to the job site. I met this good brother some decades after his conversion while he and his wife were serving a mission at the San Diego Mormon Battalion visitors’ center. The reason I like this story so much is the contrast in his two attempts to read the Book of Mormon. The first time he began to read, it was without real intent and without prayer. In the second attempt, with desire and prayer, it was an entirely different experience. “And by the power of the Holy Ghost ye may know the truth of all things” (Moroni 10:4–5). Another insightful principle we discover in this story is that you don’t have to read the entire Book of Mormon before a witness can come. For the man in this story, hetasted the light on page one. He didn’t need to eat the entire pizza before he knew if it was delicious. For others, it may be more of an acquired taste as the light becomes more delicious over time. That seems to be what Alma is saying in this verse: “Yea, it beginneth to enlighten my understanding, yea, it beginneth to be delicious to me” (Alma 32:28). As we began I asked you to score your testimony on the faith spectrum. I hope that you have discovered that your testimony is far more advanced than you imagined. With the Holy Ghost as your teacher, you have been gaining a perfect knowledge of many fruits of the gospel, and fruit by fruit, line upon line, your testimony has been growing stronger by the day. The more one learns and lives the gospel, the more light they receive and the more the Father’s plan becomes the gospel of common sense. We learn from our own experiences that the fruit of the tree of life is, indeed, precious and “most sweet, above all that [we] ever before tasted” and that it fills our souls “with exceedingly great joy” (1 Nephi 8:11–12). We grow to love it because of the blessings, joy, and control it gives us over positive outcomes in our lives and the hope of endless happiness as eternal families. I bear my witness that I know, and I know that I know, by the Holy Ghost, that the Book of Mormon is true. It is the word of God. It is sweet and precious to savor. I love and cherish its taste. I bear my witness that Jesus Christ is the Son of God and that He was crucified and suffered for the sins of the world. He is our Savior and continues to lead and guide His Church and kingdom here upon the earth through living prophets and apostles. I bear witness of His name and of these sacred truths in the name of Jesus Christ, amen. 1. 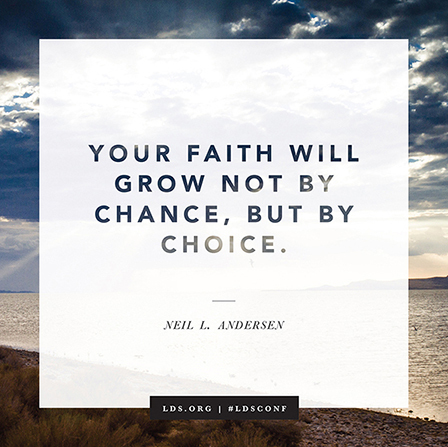 See David A. Bednar, “Seek Learning By Faith,” Ensign, Sept. 2007, 60–68. 2. See Wordsense.eu Dictionary, “conscientia,” http://www.wordsense.eu/conscientia/. 4. Joseph Smith, in History of the Church, 6:428. 5. Brigham Young, Discourses of Brigham Young, sel. John A. Widtsoe , 433. 6. Dieter F. Uchtdorf, “Receiving a Testimony of Light and Truth,” Ensign or Liahona, Nov. 2014, 22. 7. Joseph Smith, in History of the Church, 2:8. 8. Guide to the Scriptures, “Faith,” scriptures.lds.org. Conversion includes a conscious decision to give up one’s former ways and change to become a true disciple of Jesus Christ. 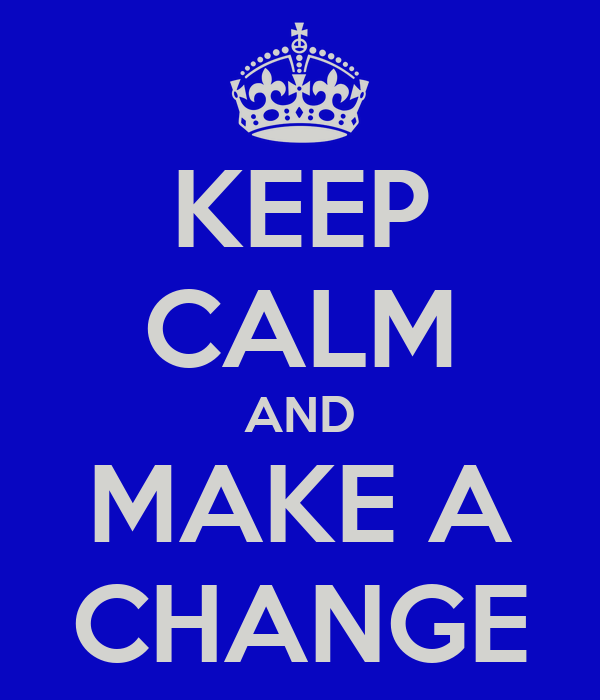 It requires a change in behavior, but it goes beyond behavior; it is a change in our very nature. It is such a significant change that the Lord and His prophets refer to it as a rebirth, a change of heart, and a baptism of fire (see Mosiah 27:25–26). Conversion seems to be a process, rather than an event, and comes as a result of righteous efforts to follow the Savior. These efforts include exercising faith in Jesus Christ, repenting of sin, being baptized, receiving the gift of the Holy Ghost, and enduring to the end in faith. They desire to do good. (see Mosiah 5:2; Alma 13:12). They do not rebel against the Lord. (see Alma 23:6-7). They share the gospel. (see Enos 1:26; Mosiah 18:1; 27:32-37; Alma 10:1-12; 15:12). “True conversion will strengthen your capacity to do what you know you should do, when you should do it, regardless of the circumstances” (“Full Conversion Brings Happiness,” Ensign, May 2002). The thousands of Lamanites who accepted the gospel demonstrate that conversion is a spiritual change—becoming a new being through the power of God. The scriptures describe the Anti-Nephi-Lehies as being so “converted unto the Lord” (see Alma 23:3,6,8,13; 24:6), that they “never did fall away” (Alma 23:6). The Anti-Nephi-Lehies who were “converted to the Lord” made a covenant to lay down their weapons of war. They buried them deep in the earth as a testimony of their desire to change (Alma 24:17-18). The Amalekites and Amulonites, who were former Nephites, stirred up many unconverted Lamanites to anger against their king and the Anti-Nephi-Lehies. Many of the Anti-Nephi-Lehies sacrificed their lives rather than break their covenant with God (see Alma 24:6–19). “In abandoning sin one cannot merely wish for better conditions. He must make them. … He must be certain not only that he has abandoned the sin but that he has changed the situations surrounding the sin. He should avoid the places and conditions and circumstances where the sin occurred, for these could most readily breed it again. He must abandon the people with whom the sin was committed. He may not hate the persons involved but he must avoid them and everything associated with the sin. He must … build a new life. He must eliminate anything which would stir the old memories” (The Miracle of Forgiveness , 171–72). It has been my experience that the more I EXPERIENCE the gospel, the greater VALUE I place upon it. Use the “Degrees of Discipleship” scripture-chain listed below as an illustration of this principle of change and conversion. 3rd Degree Disciple: Alma 20:23, Oddly enough he values his kingdom even more than his life at this point. What does a dead king do with half a kingdom anyway? 1st Degree Disciple: Alma 22:18, Eventually, our great desire for the “future” that God has promised the faithful becomes so great that we not only are willing to give up “the world”, but we are willing to give up “ourselves”.